Writing this little guide was almost a nixed idea on our end, but the fact is that a lot of CNC plants receive visitors from time to time and many of them don’t know the basics of what to do when you are close to this equipment. It’s a cause to worry for any CNC machining company since they spend a lot of money training their personnel and some of them still manage to screw up on occasion. Let’s get the most obvious stance out of the way: all the tools you can place in your hand on this world are dangerous if they are not used properly. When you take into account that many manufacturing companies follow many safety protocols to prevent problems, is still baffling the number of accidents that could happen is the people near these machines don’t understand the risks of being close to them. A manufacturer that doesn’t develop a safe working environment for people operating tools is positioning his company as a potential hazard that could bring trouble to their workers and their clients as well. Too many people prefer caution over a consequence. Trained workers operating under a secure environment makes a reliable operation. Accidents do happen when people don’t follow safety instructions or if these are not clear enough. You could say that bits are the ones shaping your earnings and the projects of your clients. Why would you use cheap ones, to begin with? If you use low-quality bits to carve the raw materials you work with, you will get an accident sooner than later. You also risk an increasing number of hazards in the form of laborer incidents. Avoid low-quality bits for your CNC machine at all costs. Take into account the fact that only quality cutters leave fewer chips. 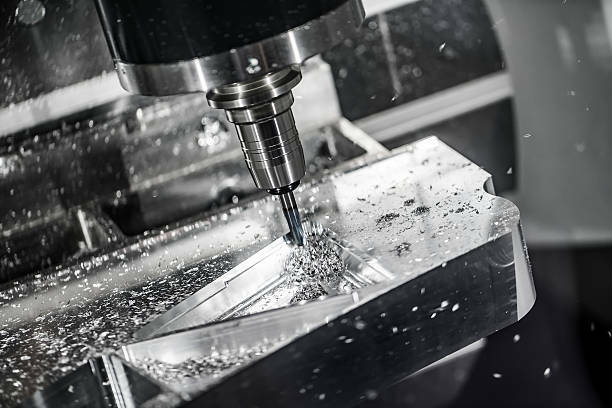 Fewer chips prevent any risk of flying bits causing an accident and allow your CNC machine to perform all routing operations safely. Revisions are also necessary on the technician’s end. They need to make sure that the moment they handle the cutter before getting started with any task is secure by making sure that the cutter is placed correctly before beginning any routing operation. If your personnel is working with cracked or chipped tools, there is an increased risk of damaging the quality of the product being carved or cut. The technician needs to make sure that all the tools are sharp and free of any cracks. All the workers, as well as the visitors of a CNC Machining operation, should wear safety glasses, period. By not wearing safety glasses the visitor or the employee is exposing themselves to hazards that could damage their eyesight. On any CNC Machine Company, there is flying debris everywhere; shielded eyes with safety glasses prevent any trouble. If you happen to be a CNC enthusiast with a router for personal use, or if you are in charge of an industrial operation, you need to follow the standard safety protocols while operating any machinery to avoid injuries. Ear protection is not a requirement in this industry most of the time, but your hearing might be sensitive to the loud noises created by these machines, use them at your discretion. A breakdown of the CNC machine can translate on minor errors on the project. When you operate a CNC machine, you need skills and experience on certain maintenance tasks to keep the equipment working. Make sure you understand how to replacing drills, knobs and how to troubleshoot the machine if it gets stuck. Most of the problems of any CNC machine are caused by poor maintenance, but a quick troubleshooting can get them back on track again. From a company’s perspective working with untested software is a mistake. The code could be wrong, and the program to handle the project could lead to missed pieces of the product being developed, Make sure to work with certified software. If you still happen to bump into a programming error, you only need to reboot the system. CNC machines work better with a human supervising their performance at all moments. There is no way around it. Very few can actually be left working on extended cycles. The technician needs to make sure it’s working as it should at all moments and should also make sure that it is turned off properly when a task is finished.